A gardener's revolution, basis of transition thinking & inspiring ways of life. What is involved with the diploma designs? On the left are my designs in applied permaculture. Hope you enjoy, please copy! let me know if anything is useful to you. I'm Dano, I went to a permaculture convergence in 2000 and felt my eyes widen and ever since I have loved the people I have met, the ideas I've learnt about and the ethics of earth-care, people-care and fair-share as a way of living. I did my PDC permaculture design certificate in IPEC Brazil in 2003 and added permaculture to my love of gardening. I had already studied psychology and horticultural therapy so felt I was merging the two ethics of people-care and earth-care when I started a 4 year herbal medicine degree. Herbal Permaculture = Herbaculture. I started my business in 2006 called herbaculture. With two friends, we started the diploma in applied permaculture design in January 2010 and without rushing it finally feels Im getting on with it. An initial blog I started: http://permacultureclub.blogspot.co.uk/ . I have already dropped some designs due to not honesty having perma- designed them. 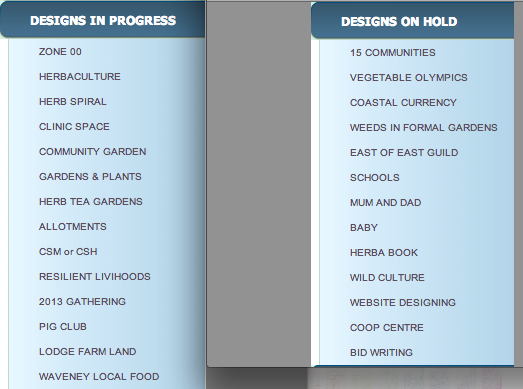 Life happens and cool stuff takes place, so, my aim is to develop a process of dealing with the many ideas I have and I hope the 10 designs (tabs on left) show how 'permaculture design' is more than just 'design' but part of life. I am using this website to help me develop a process. I will probably use the later designs as they were intentionally designed from the outset (a skill I am learning) rather than muddled through with permaculture in mind. I am very happy that the diploma process allows me to sort out my methodology as it's vital for me to be professional and create an ethical practice. July 2012 update: I have moved house, changed some of my income streams and after a few months of flux find myself able to continue with my diploma. It seems that getting the hang of what a permaculture design is is very useful for designing for changes in one's life - if I could document the flux I would of had a clearer decision making process and half my diploma done. Nigel answered the question of 'what a permaculture design is by saying - "anything that takes the permaculture ethics and principles into account when designing". Thanks also for seeing your designs Nigel, really helps to get me started. I still haven't written up any designs and my aim for accreditation by September's convergence has flown by. December 2012 update: Now approaching 3 years, I really want to use this lull time in the last week of the year to get as much written up as possible. The aim now seems to get the hang of using design skills for everything I do. I feel that this is the whole point of the diploma. With an Permaculture Eastern Gathering approaching in July 2013 there is a great opportunity to be finished by then. ​Update Feb 2014: The eastern permaculture gathering in 2013 was amazing but I didn't get my diploma finished for that, darn it. I'm not in a hurry but having moved twice more since the last update and had a major health scare. I am now just finished writing up reports from a part time job promoting local food growing so in theory I have mental space to get this written up. Update April 2015: Another year has past and I have moved to a community near where I grew up. I have been building, gardening and generally filled with enthusiasm for Spring. I am missing the second Eastern Permaculture Gathering in Norfolk whilst I write this which has sparked me to update my designs as much has happened and of course I have new ideas that warrant a design. Update February 2016: I now live in a community 3 miles from where I grew up. Built my room in the 40 person community and feel finally that I will stay put for the foreseeable future. I think of the many things I have done and instead of permaculture designs that are written up I am developing a reflective process of project management where things get down and I am able to see solutions all the time. Looking forward to getting this diploma finished. July 2016: I feel I am ready to submit the first 5 deisgns. On reflection I think I need to focus more on land based designs with the technical drawings and finished designs for future client work that I hope to include in the Permaconsultancy design in the next half. I am pleased to get on top of planning and designing events and hopefully will see this side of my income generation take off. I am seeing the design process as part of becoming more what I want to become and sort out ideas I have had for myself and my business for a while. On Reflection I think I am perhaps more interested in non Land based permaculture designing so I hope to bring some key learnings to add to growing permaculture wealth of experience. Working out what designing and the design process means for non land based permaculture could perhaps be reflected in various methods that we use to make decisions, yup I will use the next 5 designs to explore this more. November 17: Just sorting out with Hannah my tutor to finally get the work I have done ages ago up to scratch for assessment. I am starting a social enterprise and I really want this finished so I can focus on Herbaculture CIC. ​January 18: nearly there........ at the start of the next ten design of the rest of my life. WAnna SAY HI & LEAVE A COMMENT?